This is the simplest type of two-stroke engine in which both inlet and exhaust are controlled by ports in conjunction with a single piston. Inevitably this arrangement results in symmetrical timing which from the standpoint of scavenging is not ideal. In the first instance the ‘loop’ air motion in the cylinder is apt to produce a high degree of mixing of the incoming air with the products of combustion, instead of physical displacement through the exhaust ports. As a result the degree of charge purity (i.e. the proportion of trapped air) at the end of the scavenging process tends to be low. 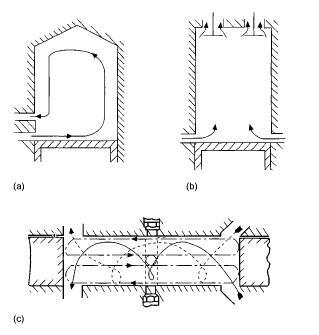 A second adverse feature resulting from symmetrical timing is loss of trapped charge between inlet and exhaust port closure and susceptibility to further pollution of the trapped charge with exhaust gas returned to the cylinder by exhaust manifold pressure wave effects. The great advantage of the system is its outstanding simplicity. In two-stroke engines combustion occurs in the region of top dead centre (TDC) of every revolution. Consequently gas exchange also has to be effected once per revolution in the region of bottom dead centre (BCD) and with minimum loss of expansion work of the cylinder gases following combustion. This implies that escape of gas from the cylinder to exhaust and charging with fresh air from the inlet manifold must occur under the most favourable possible flow conditions over the shortest possible period. In practice the gas exhange or SC AVENGING process in two-stroke engines occupies between 100° and 150° of crank angle (CA) disposed approximately symmetrically about BDC. Two-stroke engines may be subdivided according to the particular scavenging system used into the following sub-groups.